Even though it seems like summer has just begun, the new school year is right around the corner. Whether you are the mom who carpools kids to school every morning or you are getting ready for your first year away at college, taking the time to treat yourself before school starts is one of the best things you can do to prepare yourself for the academic year ahead. 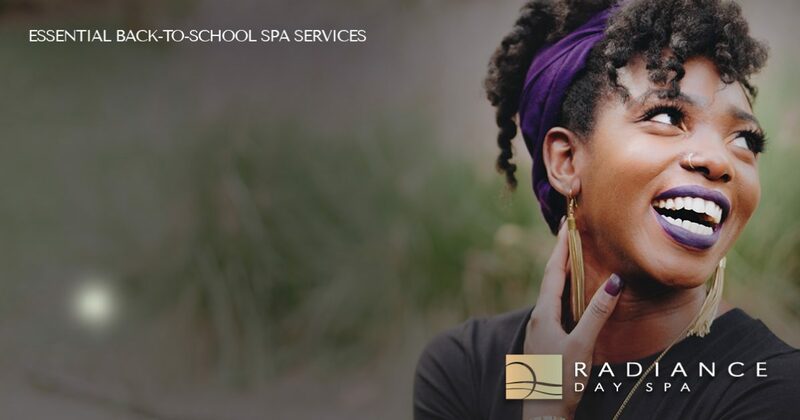 Radiance Day Spa in Sioux Falls is here to provide you with the spa services that will help you relax, rejuvenate, and revitalize. Book your appointment for pedicure and manicure, facial, massage, or hair removal services today! Treat Yourself Before School Starts! If you can’t remember the last time you got a spa-quality facial, then there is no better time than the present to treat yourself to this luxurious service. Regular facial treatments can rejuvenate your complexion, and you can get expert advice from our aestheticians to up your skincare routine. The plant extracts, botanicals, and natural acids and enzymes will leave you with a healthy glow that will carry you into the new school year beautifully. Everyone loves a good nail care service, and getting a pedicure and manicure is one of the best ways to treat yourself before school starts. When you get a pedicure and manicure from Radiance, you can refresh your soul while your feet and hands get the attention they deserve. Our nail techs apply moisturizer, shape your nails, groom your cuticles, and apply a long-lasting shellac of your choice to prepare your hands and feet for the busy months ahead. If you are getting ready to send your daughter away from college, you’ve probably found yourself wondering where the time has gone. It probably seems like just yesterday that she was starting Kindergarten. There is no better way to spend some quality time with your daughter than by getting a mother-daughter massage at Radiance! Our massage suites provide the perfect atmosphere for reflection and bonding with each other before she sets out on her own. Before school starts, it can seem like there are a million things you need to get done. Shopping for school supplies and new clothes is important, but so is making your appointment for hair removal with Radiance Day Spa. We offer a wide variety of natural hair removal services, including sugaring and waxing, and we are happy to help you with facial hair removal and upper body waxing, as well as leg and bikini waxing. Book Your Spa Retreat Today! Searching for a way to help you put your best foot forward in the carpool or classroom this August? Contact Radiance Day Spa! We would love to speak with you about the benefits of ongoing, spa-quality treatments and answer any questions you have about our services. We provide a wide variety of spa services in Sioux Falls, and whether you want a pedicure and manicure, a massage, or another treatment, you’ll love what we have to offer. Book your appointment now!